SULDN would like to thank those of you who have expressed your opinions towards our latest collection, Goddess. We are a small fashion brand in East London and, as a designer, I thrive on finding inspiration through different culture and arts movements. It was never my intention to cause any offence or upset to anyone, my intentions were only to share my passion for different cultures, religions and intricate designs. Admittedly, and unfortunately, you are not the first designer to have felt the wrath of worldwide outrage due to a lack of acknowledgment for religious and cultural sensitivities in the name of a global collective fashion ethos. 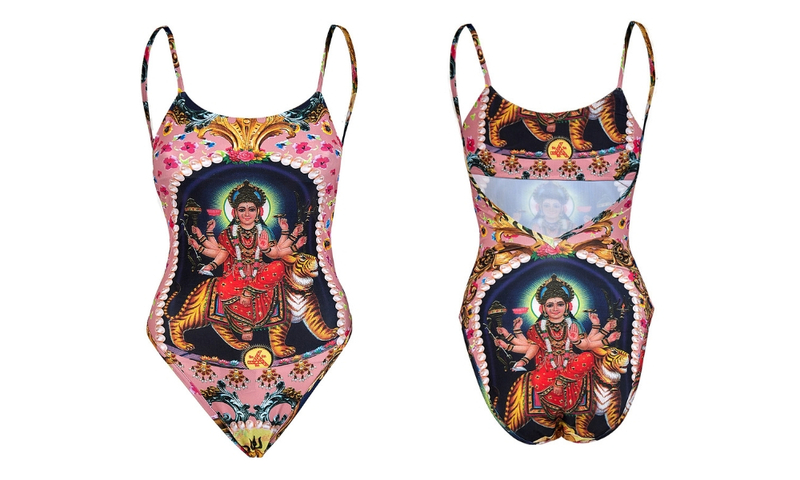 In May 2011, Australian designer Lisa Burke was forced to pull her line of Goddess Laxmi printed swimwear, following protests by Indian community groups in Sydney. Cultural appropriation is one of those icky debates where I find myself torn between wanting to both retain and respect my culture, while also accepting and embracing the globalisation of my core roots — yoga, Sanskrit chanting, food, and fashion — all of these elements that have comfortably marked their territory across the world. But where do we draw the line? The steps are daubed with hippies, wearing Om and Ganesha parachute pants, their hair in dreadlocks, bindis mark out the third eye in the middle of their foreheads. They tie their dogs up the bicycle racks using scratchy sari material and then they enter the yoga studios to be nataraja and ashtanga geniuses. You, Sera, have also stated that your collection was inspired by your journey through yoga and meditation, to depict women’s power and attitude. How, may I ask, do you think this was achieved? Whilst I do not declare myself as a righteous or highly religious Hindu woman, I can’t imagine ANY Christian accepting me fashioning the crucifixion of Christ on a piece of material across my Hollywood-waxed female anatomy — do you? You claim your brand is about girl power, yet you fail to see the everyday empowered Hindu woman through your rose-tinted lenses. Goddess Durga, or Sherawali, as she is often known in Hinduism, is the divine female deity who depicts strength, purity, courage, and one who protects against evil. Across India and throughout the world, she is celebrated in numerous festivals through dance, prayer, food, colour, and music. Whether it’s the colourful nine-day Navratri festival celebrated by Gujaratis or the mammoth Durga puja in Kolkata for which the streets are lined with giant Durga statues, they all represent a homecoming of goodwill and hopes of a new tomorrow, bringing together families and communities alike. Goddess Durga’s place of residence is in homes and people’s hearts, not across someone’s cleavage or buttocks. Through Hindu mythology, our ancestors found their own form of female empowerment from this idol who sits proudly on a tiger, showering blessings from her eight hands. As far-fetched as this depiction may seem to an outsider, go ahead and look, and you’ll find her presence in even the smallest of homes in rural India. Ask the poorest of children, who sit with her photo, clinging onto hope, under the streetlamp to try and study (just as I had witnessed outside our family home in India). Listen to the tales of those grandmothers, who found their own voices and identities simply through conviction and belief of a presence bigger than they could imagine through Goddess Durga. Sera, you can try and squeeze your vision of Durga on as little clothing as possible, but what you cannot take credit for is the purpose of her entire being. So, please, stop with the loose statements of what you define as female empowerment because we are already there.